Financial woes have a habit of spoiling summit parties. The European Commission is now in an ongoing debate as to whether its meeting should be used to come to an arrangement co-ordinating package loans to assist Greece out of its deepening financial hole. German Chancellor Angela Merkel will have none of it. While José Manuel Borroso, the current European Commission president, is insistent on the cooperative measures, the prickly chancellor has a different assessment. ‘There’s no looming insolvency,’ she suggested to Deutschlandfunk. ‘I don’t believe that Greece has any acute financial needs from the European community and that’s what the Greek prime minister keeps telling me’ (Guardian, 21 Mar). Volatility in the European financial system has been exacerbated by speculations of a possible bailout, the elephant in the room that threatens to stampede at any given moment. Greece has to refinance €8.2 billion euros in debt this April, and another €8.5 billion in May. These figures do not include necessary borrowings to pay ongoing bills. Scotch such talk now, urges Merkel, before it unnecessarily drives markets down. The Euro has received a battering as a result, losing its shine to the diplomatic chatter in a manner that Luxembourg Prime Minister Jean-Claude Juncker has deemed unreasonable. And that chatter has been considerable, revolving around a commitment by eurozone finance ministers to agree to some provision of ‘co-ordinated’ bilateral loans for Greece. Whatever Merkel might have in mind, the Greek prime minister, George Papandreou, seems to think differently, waiting for a plan to materialise out of the ether. Even if the issue of a bailout is not discussed at the Brussels summit this Thursday, the beleaguered leader will have to hunt elsewhere, using the threat of going to the IMF as a means of discrediting the eurozone. The credibility of Europe’s single currency system will then be shredded. Would the IMF be such a negative proposition? The Journal does not think so. It points out various advantages over a rescue package emanating from Paris, Berlin or Brussels. For one thing, IMF involvement might actually prevent a possible devaluation. A firm line would also be discouraging – the IMF would be the avenue to go for a delinquent eurozone member rather than the EU. Single-currency systems do not require single governments but responsible ones who account for their misjudgements. The modern financial system, but notably ones with such close ties as those within the eurozone, means that the irresponsible and the lethargic may be left behind, but at considerable cost. It is also complicated by the fact that such a backer as Germany has an enormous surplus in exports relative to other eurozone countries, a feature that makes other nations, by virtue that fact, incapable of ‘devaluing’. The single currency becomes a shackling device. 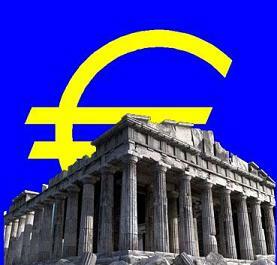 The Greek economy is no exception, haemorrhaging under a financial strain that is gradually inducing panic. It is also ranks rather lowly in competitiveness. Olli Rehn, Europe’s commissioner in charge of economic and monetary affairs, feels that the commission will just have to be more involved in national budgets in the future. But that will have to wait for another day.